13MP primary camera and 5MP front facing camera. 5.5-inch (13.97 centimeters) TFT IPS capacitive touchscreen with 1280 x 720 pixels resolution. Android v5.1 Lollipop operating system with 1.3GHz Cortex-A53 MT6753 Mediatek Octacore, 3GB RAM, 16GB internal memory expandable up to 64GB and dual SIM (4G+2G). 3000mAH lithium-ion battery providing talk-time of 15 hours and standby time of 400 hours. Here are some added features to cool pad note 3 which are not available in previous models. Advanced fingerprint sensor takes just 0.5 seconds to unlock the screen and can automatically detect dry or wet fingers for better accuracy. Coolpad has high security compared to other devices so feel free to store important data to your mobile. Access various applications with a touch of your finger. Also Customize different fingers for different applications, like forefinger to open the Camera & ring finger for Phone Tool and more. 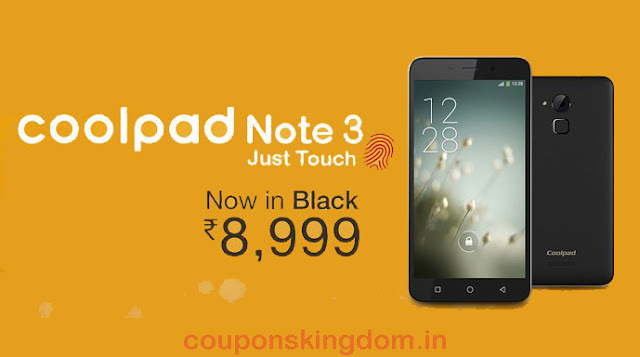 Buy Coolpad Note 3 Here at a price of Rs.8,999 and save Rs.500 here. Note : Couponskingdom is not responsible for guarentee of any product, we only bring the best deals for you from Amazon India. Some products might have delivery charges. Cash on delivery is available on most of the products.